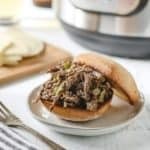 Make this Easy Instant Pot Italian Beef and get ready for the compliments! A hint of spice and tons of flavor make these sandwiches a total crowd pleaser. This sandwich has strong Chicago roots. 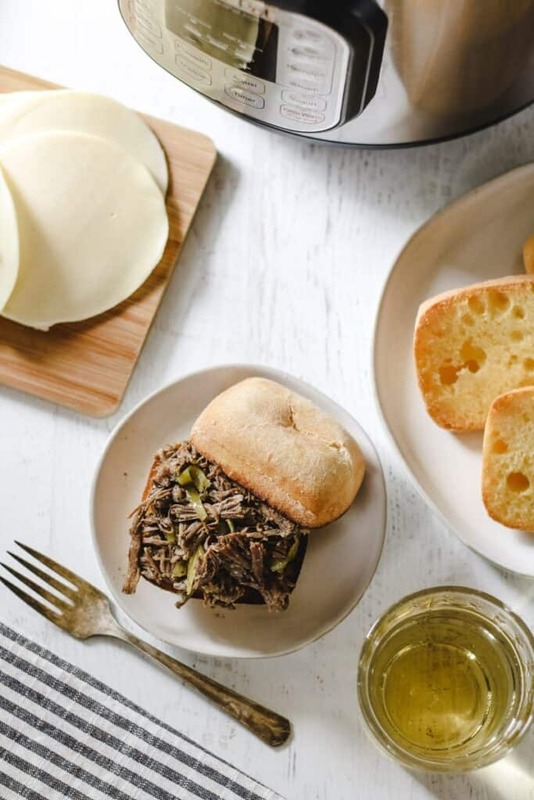 Around these parts, Italian Beef is common at parties and family get togethers because it’s the perfect make-ahead main dish and a total crowd pleaser. Inside scoop: I’ve personally gotten compliments that my Italian beef is ‘the best’. So if you’re looking for a great recipe… you’re in the right place! 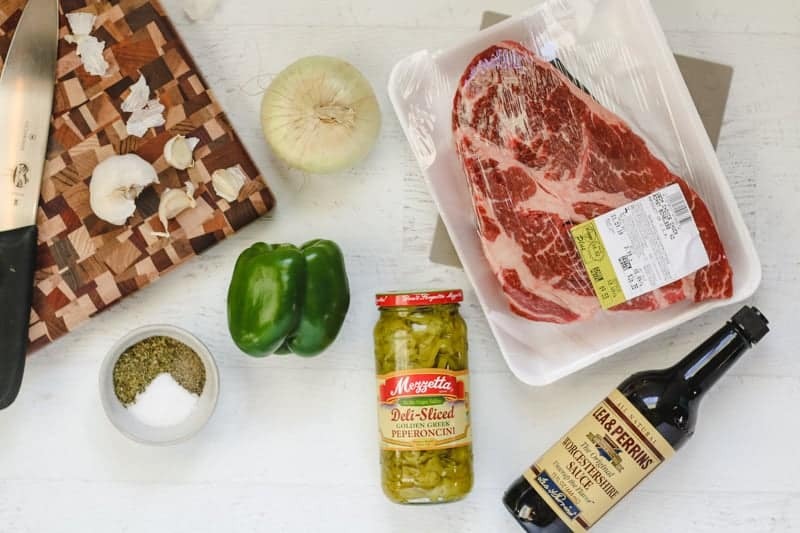 The ingredients for Italian beef are some of the most simple ingredients but they really pack a flavor punch! 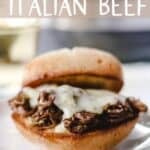 Beef Chuck Roast: I use a chuck roast for my Italian beef, which makes for a shredded Italian beef sandwich that is fall apart tender. The chuck roast has great beefy flavor. Sliced Pepperoncini Peppers (affiliate link): The whole jar, brine and all. This, you might say, is the secret ingredient. You most definitely cannot skip this ingredient! You will find these peppers in the condiment aisle. They’re usually on a top shelf by all the other pickled items. Bell pepper, Onion, & garlic: our mirepoix of flavor! Kosher Salt, black pepper, Italian Seasoning and a dash of Worcestershire sauce: additional flavor boosters! I love using the Instant Pot Pressure Cooker (affiliate link) for this recipe. You can cook the beef in the oven or slow cooker, but the Instant Pot is quick, easy, and less of a mess! Set the Instant pot to Sauté. While the pot heats up, season the beef chuck roast liberally with kosher salt, black pepper, and Italian seasoning. When the display reads ‘HOT’, drizzle a little olive oil in the pot and sear the roast on both sides. Then toss the diced onion, bell pepper, and garlic on top of the roast. Pour in the whole jar of pepperoncini peppers, brine and all! Next, put the lid on the Instant pot and turn the valve to sealing. Set for 45-55 minutes. When the pressure releases, remove the lid to see all the beefy goodness! Lastly, put the beef back in the pot with the juices. After the beef is cooked and shredded… you have options! Serve immediately: Hold the beef on the Keep Warm setting on the Instant Pot. Serve later: Store the beef, covered, in the refrigerator for up to 3 days. I do this right in the Instant Pot liner with a lid on top. Freeze: Yes, you can freeze it! Freeze the beef in a container that would fit inside the instant pot, like a 7-cup round pyrex dish (affiliate link). Then when ready to use, slide the whole frozen block back into the instant pot and reheat. 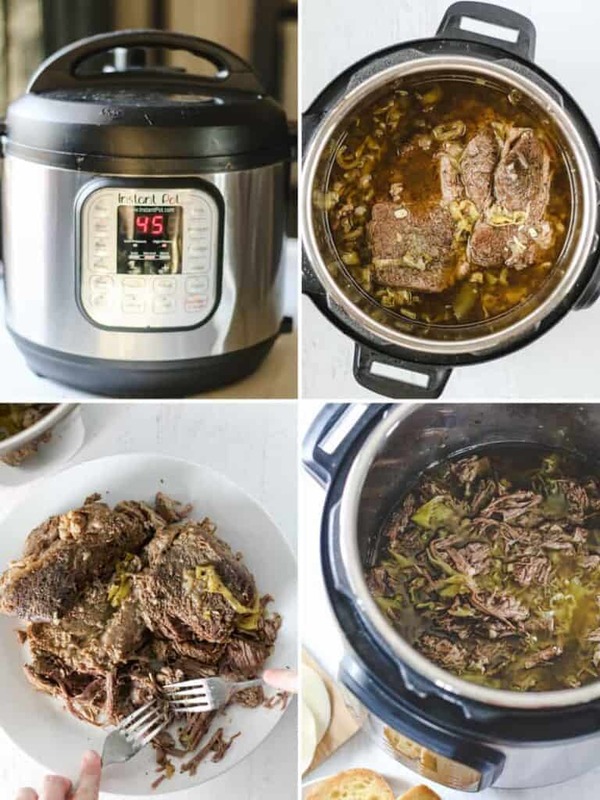 Reheat refrigerated or frozen beef: Put the beef back into the Instant Pot. Put the lid on and set the Instant Pot to Manual for 5 min. Hold the beef on the Keep Warm setting throughout serving. 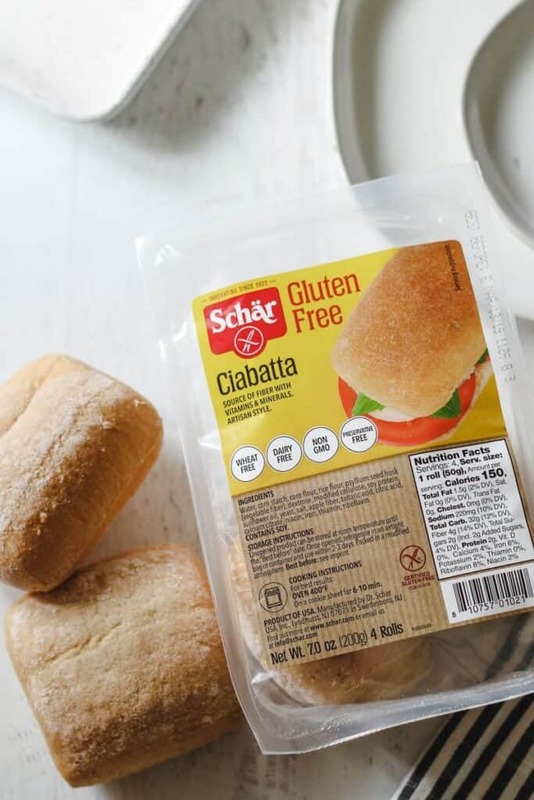 To make the sandwiches: My favorite gluten-free roll for this sandwich are the Schar gluten-free Ciabatta rolls (affiliate link). Otherwise, for non-gluten free, a hoagie roll is the way to go. Lightly butter and toast the rolls. Serve the beef piled high on the roll. If you like cheese, top with Provolone and pop the sandwiches under the broiler for just a minute to melt the cheese. Then just sit back and wait for the compliments to roll in. 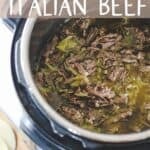 Instant Pot Italian beef is great for Super Bowl parties, birthday parties, or even the holidays! I would serve it with chips and dip, loaded potato skins, or even these bbq chicken wings! 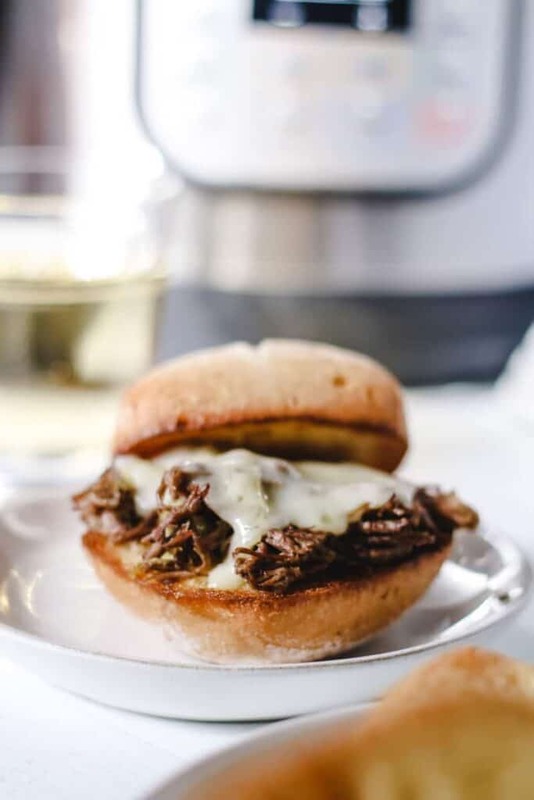 Tasty Chicago-style Italian Beef made super easy with the help of the Instant Pot. Full of spice and flavor. Sure to be a total crowd pleaser! Heat the Instant Pot on saute mode. Liberally season the roast with kosher salt, pepper, and Italian seasoning. When ‘hot’, drizzle olive oil in pot and brown the roast both sides. Place the onion, bell pepper, and garlic cloves on top of the roast. Dump in the entire jar of pepperoncini peppers. Add the Worcestershire sauce. Place the lid on the Instant Pot and turn valve to sealing. Cook on Manual for 45-55 min, NPR. Release the steam valve. Remove the roast and shred. Return the meat to the juices in the pot. Serve on buttered and toasted rolls. Optional: Place a slice of provolone cheese on top and melt under the broiler. Oven method: Heat oven to 325°. Sprinkle the onion, bell pepper, and garlic around the roast in the dutch oven. Then pour in the Pepperoncini peppers with the juice and the Worcestershire sauce. Cover with the lid and roast for 4 hrs, or until the roast is tender and easily falls apart. Slow cooker: Place the onion, bell pepper and garlic in the bottom of 6 quart slow cooker. Place the browned roast on top. Pour in the Pepperoncini peppers with the juice and the Worcestershire sauce. Cover with the lid. Cook on low for 6-7 hrs or high for around 4 -5 hrs, or until the roast is tender and easily falls apart. 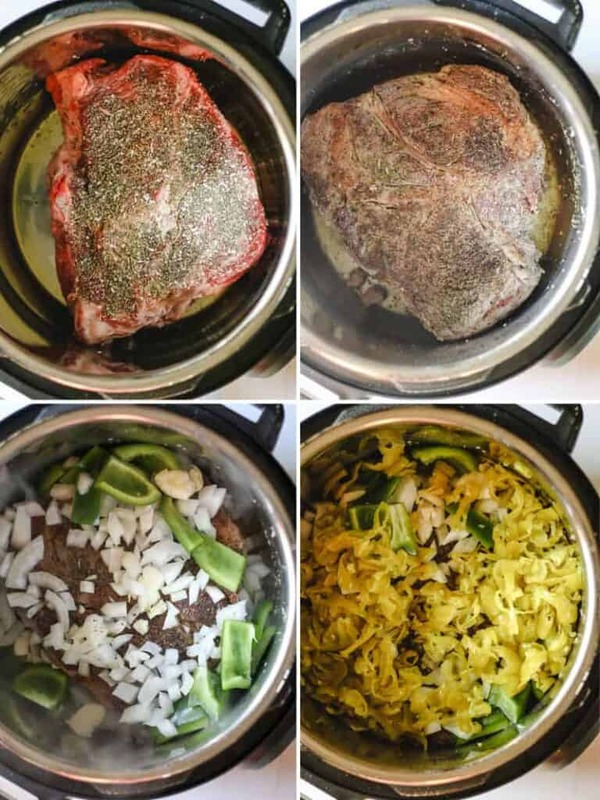 *If your beef chuck roast is really thick, you may want to cut it into smaller chunks to ensure proper cooking in the instant pot. I wouldn’t have thought to use an Instant Pot for this. Easy and much quicker than the low and slow method. Great recipe! I just happen to have a chuck roast in the freezer. ???? So, no other liquid is required for this besides the liquid from the jar of pepperoncinis? If you’re using the oven or slow cooker, you can add 1 cup of beef broth if you like.